No date. I do not like the look of this at all. Bonus: I’m in New York this weekend. 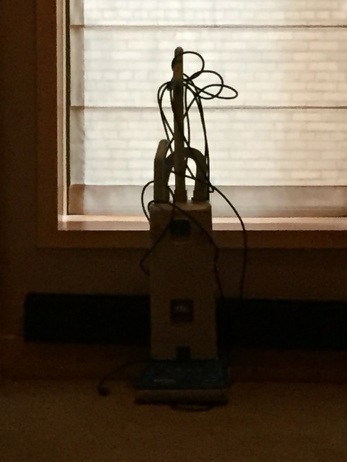 Good cleaning crew at the Four Seasons. Photo date is at least after mid-1988 when the logo on the car was adopted. Before that the academic seal was the logo. And it was before boots became “virtual” which was around 2005-6 according to a bill my son received while a student. Pretty sure that’s the back of Owl Club behind the officer’s head. The front is behind his head. The logo on the car was not adopted until the late 80s (after July 1, 1987, but I think in 1988). I served on the ad hoc committee that produced the proposal that was adopted. Good thing the Boot was not around when I was at Rice. I probably paid enough parking fines to buy one though. I wish I had kept the carbons just to see how many I had gotten. Best one was one that was written with the location identified as “President’s House Driveway – Again”. no, I was not visiting Hackerman; I had developed the bad habit of parking along that road in front of Jones when I was going to just run in to drop something off, or pick somebody up. I think they started watching for me. When I got the “again” ticket, I got the message. 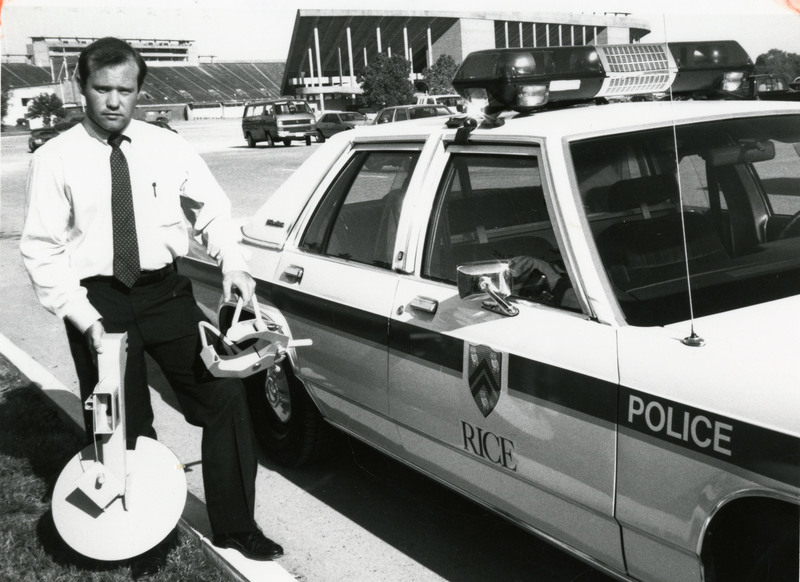 That handsome officer is Robert (“Ivan”) Putzke, SRC ’83, who started working for the Rice Police while still an undergraduate and remained with the department until 1989. He is currently Director of Law Enforcement and Chief of Police at Montana State University. Yeah, I thought that was Ivan Putzke, late in his time at Rice. Usually he was in a uniform when I saw him. And even without the logo info, it’s easy to see that that is a late-80s Ford LTD or Crown Victoria police car. I do not miss parking boots at all. Random question for you Dr. Kean (or anybody else in the know) – why is Sammy sometimes depicted as wearing a sailor hat? Eventually it is phased out of the mascot but why was he even wearing one in the first place?